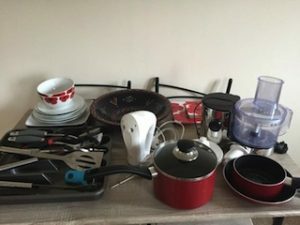 A large collection of kitchen accessories, to include poppy patterned coasters and placemats, a cutlery drawer, utensils, a white handheld electric whisk etc. 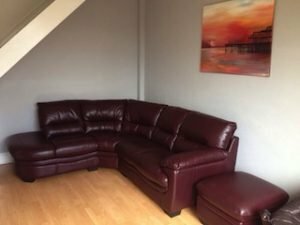 A five seater high back left hand corner sofa and matching storage footstool, upholstered in deep purple faux leather. 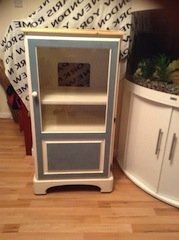 A small hand painted blue and white solid pine bathroom dresser, having a glass inlaid door opening to reveal three shelves. 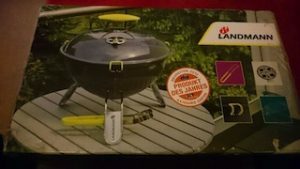 A brand new boxed Landmann lime green and black portable kettle charcoal barbecue. 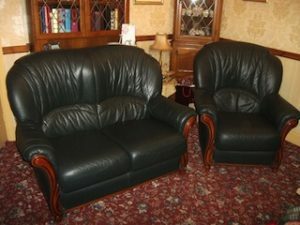 A two seater high back vintage sofa and matching armchair, upholstered in green leather on mahogany bases. 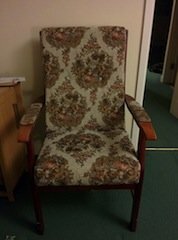 A vintage high back solid wood fireside armchair, upholsters in lady printed fabric. A tall standing vintage mahogany and glass kitchen dresser, having a cupboard to either side of a central shelf and drawer to the top, and three drawers above three cupboards to the bottom. 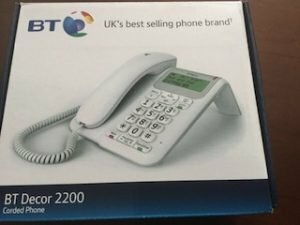 A brand new boxed BT Decor 2200 telephone. A vintage solid wood hand painted yellow and pink bedside dresser, having a shelf above two small drawers. 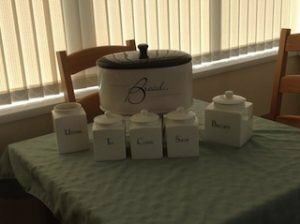 A collection of white ceramic kitchen accessories, to include a large oval bread bin, a biscuit jar, a utensil holder and tea, coffee and sugar canisters. 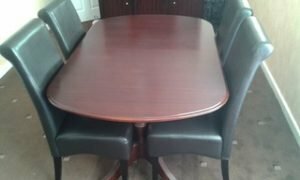 A solid mahogany vintage extendable dining table, together with four high back dining chairs, upholstered in black faux leather. 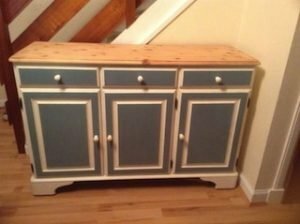 A hand painted blue and white solid wood sideboard, having three small drawers above three cupboards. 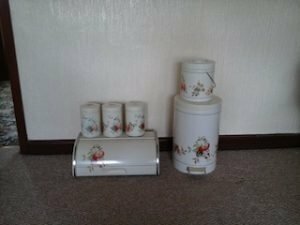 A collection of white fruit patterned vintage kitchen accessories, to include a small bread bin, a tea caddy, a large bread bin and tea, coffee and sugar canisters. 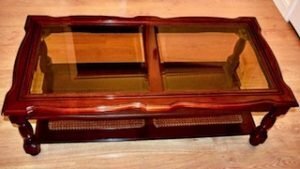 A large vintage solid mahogany rectangular coffee table, inlaid to the top with two glass panels. 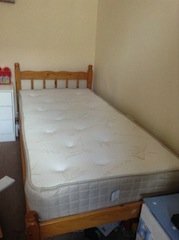 A solid pine singled bed frame and headboard, together with a white single mattress. 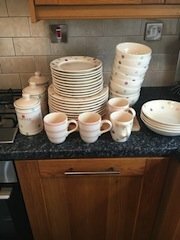 A collection of polka dot and striped patterned kitchen accessories, to include four mugs, soup bowls, canisters etc. 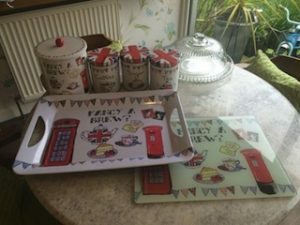 A set on England themed kitchen accessories, to include a glass chopping board, a dinner tray, a tea caddy and tea, coffee and sugar canisters. 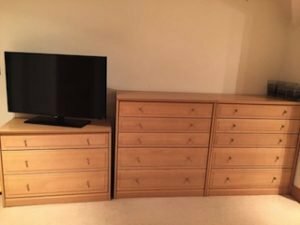 A set of three solid pine large chests of drawers, together with a black Samsung flat screen television. 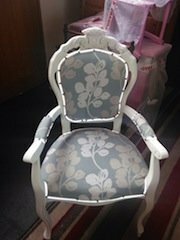 A hand painted white solid wood high back hall chair, upholstered to the seat, backrest and armrests in leaf patterned fabric. 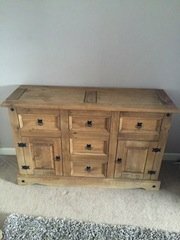 A Mexican waxed solid pine small sideboard, having a drawer above a cupboard to either side of three central drawers.